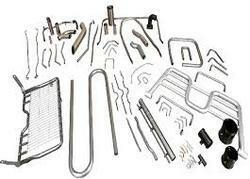 We are expert in CNC wire bending parts manufacturing, we have the CNC wire bending machine capacity from 3mm to 12mm. We "R. R. Technomech India Pvt. Ltd." have created a reputed position in the market. We are engaged in manufacturing a wide range of Bus Stop Shelter, SS Trolley, Barricade Wheel, Bike Leg Guard, etc.